WELCOME TO THE SOCIETY OF DEPRECIATION PROFESSIONALS!! The Society of Depreciation Professionals (Society or SDP) provides membership, training and professional certification opportunities to individuals seeking an in-depth understanding of capital recovery through the art of depreciation analysis. The Society was formed in 1987, in response to a need for objective and accurate estimates of equipment life, salvage and cost of removal for capital intensive industries. The SDP recognizes the professional field of depreciation analysis and promotes the development of practitioners in the field. The Society further serves as a forum for the collection, exchange, and publication of information concerning depreciation, and sanctions standards of conduct through its code of ethics. The Society holds its Annual Conference and Training in locations throughout the United States each fall. The Conference provides a unique opportunity for depreciation professionals to network and learn from leaders in the field as they discuss current trends. Our renowned training ranges from Depreciation Fundamentals to Life and Salvage Analysis courses with real-world applications to valuable instruction in Preparing and Supporting a Depreciation Study. 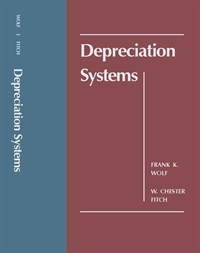 The SDP announced in 2018 the opportunity to acquire one of the foremost depreciation textbooks, Depreciation Systems by Frank K. Wolf and W. Chester Fitch. Originally published in 1994, Depreciation Systems has been out of circulation in recent years, but SDP has obtained special publication rights. This book is provided as a gift with donations to the SDP Education Fund of $40 or more. To make a donation to the fund, CLICK HERE.